The Japanese are no strangers to weird and wacky cinema, in fact, as most YouTube commenters are quick to attest , “OMG JAPANESE MOVIES ARE SO WEIRD!! !1” A host of cultural differences and an inclination towards the subversive tends to make many Japanese movies come across as strange and impenetrable to a Western audience—and then there are Noboru Iguchi movies. Directors like Iguchi go above and beyond the normal levels of weird to give viewers something truly, truly bizarre. 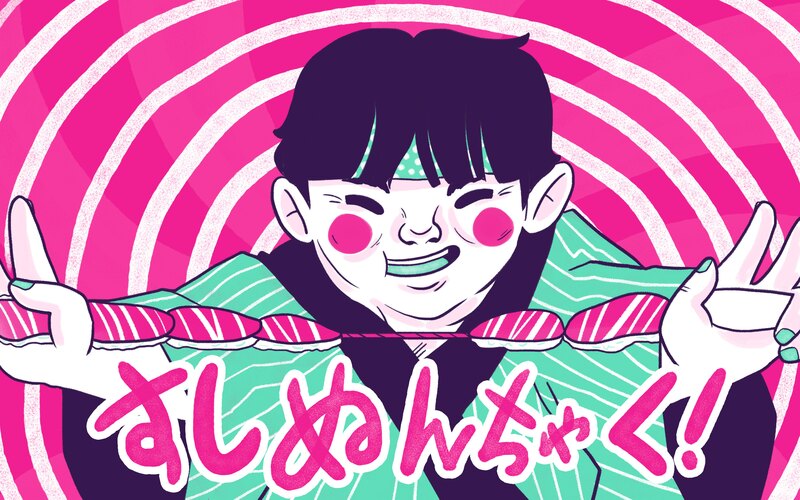 A popular social theory that many have used to explain wackiness in Japanese media is that Japan’s polite and often rigid society constricts so much that, in the areas where people get to take a break from the formality and let loose, like movies and television, they REALLY let loose. 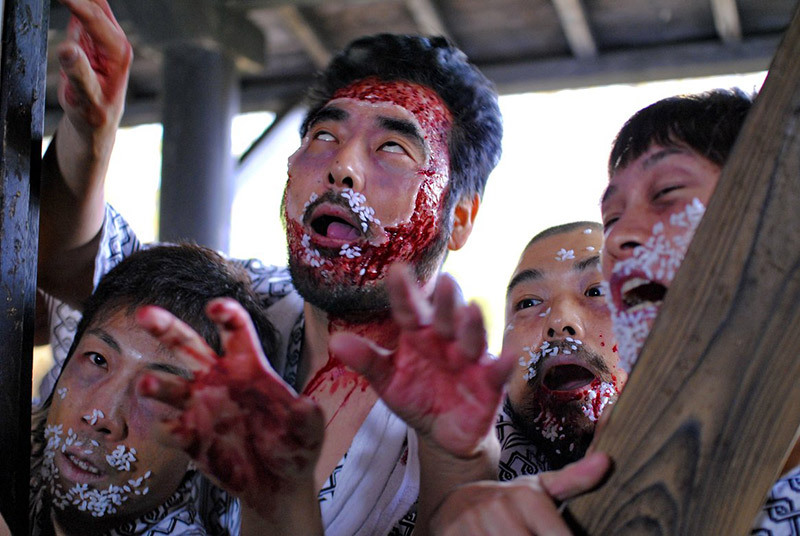 This seems to ring true with Iguchi, because his films incorporate very traditionally Japanese elements meshed with a vulgar and comedic mix of over-the-top visuals, a smattering of somewhat-deviant sexuality, and a heaping helping of violence and gore. Not surprisingly considering the overt sexual content of many of his films, Iguchi got his cinematic start in the world of Japanese Adult Video. He was even given the 2005 Best Rental Video award for some of his work with a title I’d rather not drop in polite company. Iguchi (left) and Nishimura (right) wearing fundoshi. Did I fail to mention they do Q&A panels wearing traditional Japanese loincloths? 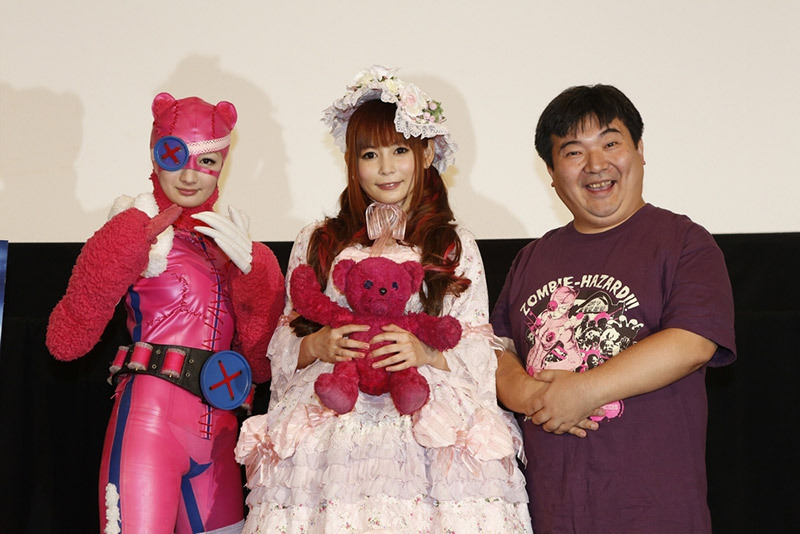 During this time he worked on some rather fringe adult films, one of which featured a robotic girl with guns for breasts, and that’s when Iguchi met long-time co-conspirator and special effects make-up artist Yoshihiro Nishimura. The two of them have worked together on many films since and Nishimura even has had promising solo directorial releases, like “Tokyo Gore Police”. 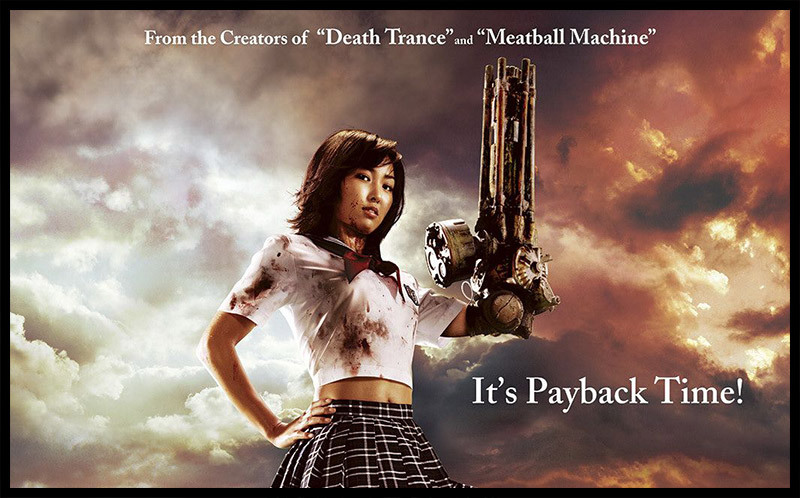 Iguchi’s mainstream filmography (although mainstream might be overselling it) is a strange and diverse catalog, starting with “Machine Girl”, which incorporates elements and stars from his adult video past. The delightfully demented and parodical “Mutant Girl Squad.” is number one for sheer entertainment value. I don’t think I can recommend this one enough. 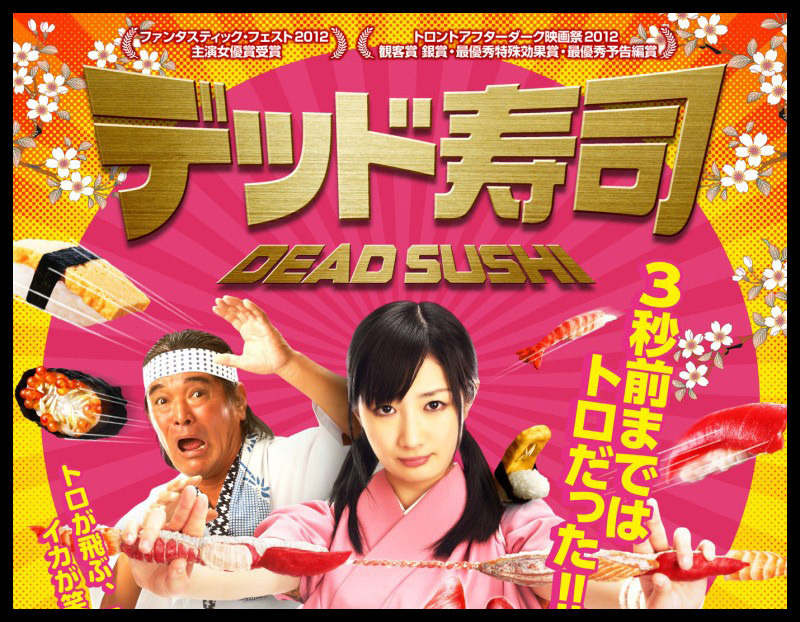 The uproarious “Dead Sushi” features some truly bizarre scenes with evil flying sushi, rice zombies, fish monsters, and a completely unexpected amount of scantily clad women. And these are just a few of his most well-known movies. He has also made forays into pure horror with “Kaidan Shin Mimibukuro Igyo”, the 9th installment in the Tomie series, “Tomie Unlimited”, as well as more conventional action films for wider audiences, such as “Karate Robo Zaborgar”, his highest budgeted film to date. Iguchi is never content to stay in one place, always tries to show his signature style in as many ways as possible, and doesn’t show any sign of slowing down. He has said: “I’d love to make very different kinds of films, from different genres. I want to try everything at least once. Actually I am a big fan of the Farrelly brothers and would really like to try making their kind of movie.” It’s hard to tell what else we will see from Iguchi over the years. Every time he announces a movie, it is a new surprise. Wow! There you have it. A lot more thought goes into Iguchi’s films than your average genre film. I mean, my five-year-old cousin already pitched me the basic concept for “F is for Fart” a few years back, but in practice Iguchi has attention to detail and themes that far exceeds his subject matter. If you’re the kind of viewer that can look beyond the on-screen antics, you may also be able to take away more than you’d imagine from these bizarre flicks. If you haven’t seen any of Iguchi’s movies and you don’t mind a little bit of ultraviolence, a little bit of fanservice, and a LOT bit of over-the-top shenanigans, it might be time to give these a try. If he did his job right, you will be shocked AND entertained. And trust me, both the shock and entertainment comes in spades.